Nonprofits can earn $1,000 for hosting their first vegan event! Animal Place’s Food for Thought program has worked with over 300 organizations to adopt animal-friendly menu policies for events. We’re now offering up to $1,000 toward food costs for all-vegan events and ticket subsidies for selecting the vegan option at larger galas. The grants are possible due to the generosity of an anonymous donor. Animal shelters, SPCAs, humane societies, wildlife rescues, and environmental groups are increasingly seeing that it’s ethically inconsistent to serve some animals as food while protecting others. 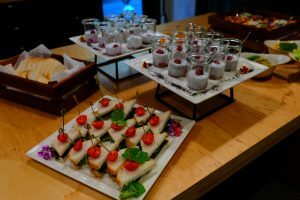 The new event grants provide a unique opportunity for animal and environmental nonprofits to practice aligning their menu with their mission. What’s truly exciting is that all of these organizations are committed to bringing a discussion to their board about formalizing a vegan menu policy. We know that it can be challenging to get boards to commit to policy changes that feel outside of the scope of their mission. The new event grants are a powerful way to show leadership that vegan events can be successful and that supporters are open to the change! SHARE this opportunity with your local shelter or environmental group.